Touch a word in the Greek New Testament and instantly view the parsing information and lexical form, along with a link to the related entry in the Analytical Lexicon of the Greek New Testament. The Greek New Testament, 5th Revised Edition, also called the UBS-5, is a scholarly edition of the Greek New Testament aimed at pastors, translators, and students. The Greek text used is identical to the Nestle-Aland, 28th edition, but the formatting has been altered to match the needs of translators within the United Bible Society. For instance, it is divided by section headings into easily identifiable pericopes. Many of these section headings are also followed by cross-references to parallel passages. Old Testament quotations are printed in bold, further increasing readability. These and numerous other minor changes make this a slightly more user-friendly text than the NA-28. The 5th edition Friberg Morphology and Parsing database provides parsing information for each word of the Greek New Testament as well as its lexical form. This parsing system was created by Timothy and Barbara Friberg. The Analytical Lexicon of the Greek New Testament gives definitions and grammatical analysis of Greek word forms across New Testament manuscript traditions including: Nestle-Aland (NA), United Bible Society (UBS) and Majority Text. It allows you to look up not only the root form, but all the inflected forms of the word. It is accessible from a link within the morphological information, and as a stand-alone resource in your library. The UBS-5 Apparatus provides information on all of the variant readings that affect interpretation or translation for each passage in the New Testament. This critical apparatus differs from the one provided with the Novum Testamentum Graece (NA28) in that it only contains variants that were deemed meaningful to students and translators. Although it is less exhaustive, it is easier to use and contains certain other features not found in the apparatus for the NA28. For example, this apparatus provides a letter grade for each reading, providing students and translators with an estimate of how certain the editors are that the reading in the main text is original. 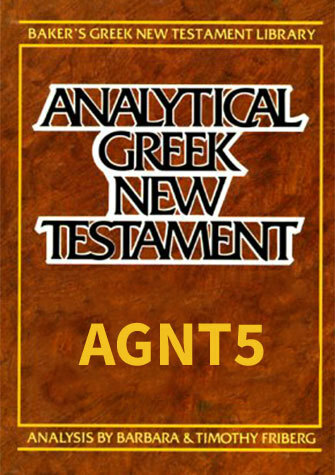 The Analytical Lexicon of the Greek New Testament is also available without the parsed Greek New Testament. Upgrade Pricing Available! If you've previously purchased the Greek New Testament or qualifying related title, you can purchase this item for a special upgrade price. The upgrade price will be visible when you log in to your Olive Tree account and add the item to your cart (NOTE: Upgrade pricing is only available on www.olivetree.com, and not via in-app purchase).